The Power House Museum of Science and Design is located in Sydney, Australia. You’ll need a little time, if you want to see all of them. The photos are under the entry for July 13, 2009. The NQA annual show was held in June in Columbus, Ohio. 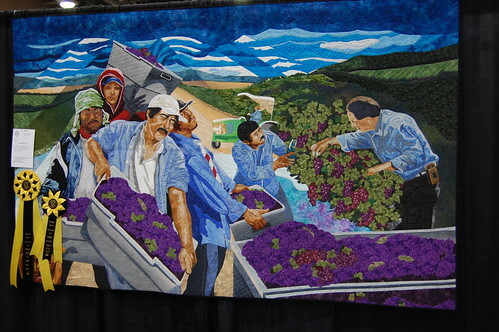 Shown below is the Best of Show Wall Quilt from the National Quilt Association’s 2009 Exhibit in June. Here is where you can see the photos of the winning quilts and list of winners from this year’s Vermont Quilt Festival. The Quilters Hall of Fame Celebration of Marie Webster’s birthday is in Marion, Indiana, the weekend of July 18, 2009. The honoree this year is Merikay Waldvogel. There are various activities scheduled….classes and quilts. I have not been able to locate a web site that gives the schedule of activities for this year’s event. Activities include the Midwest Fabric Study Group’s meeting in the Days Inn conference room. The hotel is located at the intersection of SR 18 and Interstate 69, 3 miles east of downtown Marion. Members Linda Pumphrey and Sharon Pinka will be previewing their presentations for American Quilt Study Group’s San Jose 2010 meeting, and there will be show-and-tell. This is open to the public. special hours on Sunday, the 19th, for Quilters Hall of Fame attendees, from 10:30am – 4pm. Kokomo is south of Marion and 35 miles west on SR 35. Textile works by Ashland artist Kris Hoppe will accompany the quilt exhibit. The Capital Quilt Show is on now through August 20, 2009, in the Colorado State Capital building in Denver. Here are some photos of the 250 quilts in the exhibit. about fifty Quilts of Valor that were made by one thousand people who participated in the partnership project between the Quilter’s Guild of Indianapolis, Inc., and the Indiana State Museum. The quilts were presented to soldiers wounded in Iraq and Afghanistan at Roudebush VA Medical Center on June 24th. Way to go, Folks! Thank you to our soldiers for all they do for us! Quilt Documentation book, Massachusetts Quilts Our: Common Wealth. the early eighteen hundreds up to 1950. There will be an opening reception on Friday July 17th from 5-7 pm. Authors of the book will be there for a book signing, to meet and talk with people. the Museum and hours at www.nequiltmuseum.org.